PDXEdTech Meetup: Designing Marketing Strategies for Education | Clarity Innovations, Inc.
Nick Smith, Senior Manager of Marketing Strategy at Wacom, gave a compelling talk on Designing Marketing Strategy for Education as part of the PDX EdTech Meetup on Thursday, January 11th. 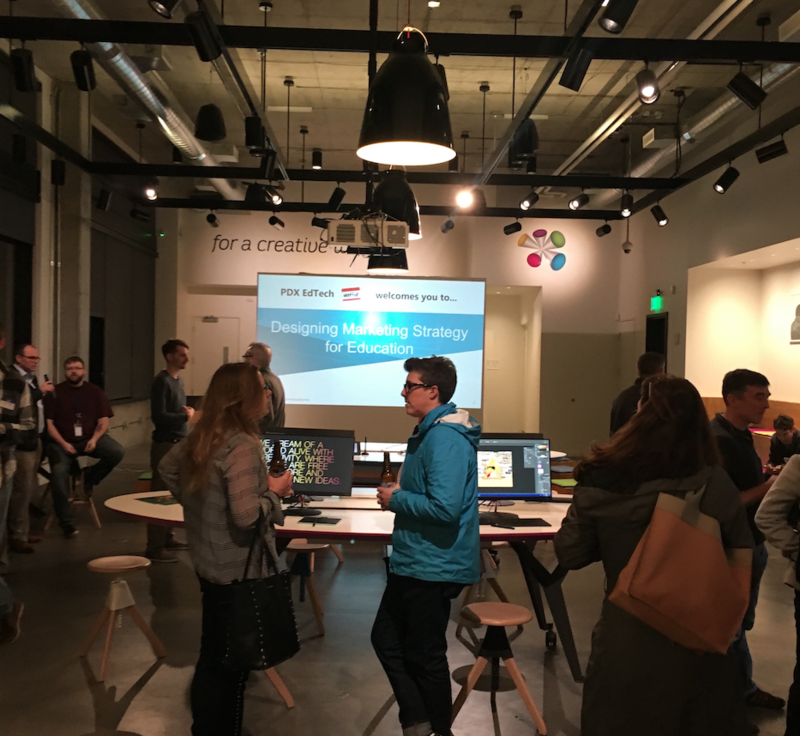 A function of the Northwest Education Cluster, the PDX EdTech Meetup Group—organized by Clarity Innovations—is a gathering of Portland-based designers, developers, content creators, and business leaders working in the Educational Technology space. Nick—who previously worked at Learning.com as their Director of Marketing and Product Marketing—explained how sales teams can best talk to school IT managers about their products, using language and benefits that speak both directly to educators as well as technology administrators. Nick also shared a “reverse funnel” approach to ABM (Account Based Marketing) where, instead of talking to every design school in America, for example, you narrow your target to the people that would really make sense to reach out to. Then, once this handful of people have had their needs met, you expand within their contact list. You build relationships with those core people first then build outward. Nick also extolled the virtues of using LinkedIn as an excellent way of finding difficult to reach education contacts. Most sales occur through the help of purchased lists, but the education landscape is so fragmented that LinkedIn is becoming one of the best ways to conduct meaningful research. Nick also spoke to the power of truly activating your most engaged accounts with auxiliary enticements beyond product. That advocacy piece is huge, yet it takes a lot of follow-through to turn accounts into ambassadors. He also stressed the need to created targeted microsites so that all messaging is available to send to prospects using relevant language. The presentation was held at Wacom’s Experience Center where attendees were surrounded by Wacom products that they could test and explore. The ability to play with Wacom products, as well as Nick’s candid take on how creative professionals are utilizing them, helped make for a memorable evening full of actionable insights.